We all know what fear feels like. It’s a ball in the pit of your stomach, a nausea-inducing throb in the gut. But how do you know whether you should listen to that fear because it’s a sign that you’re making the wrong decision — or whether you should tell it to take a hike? Good Fear, the kind that you should listen to when it screams RUN! often feels oh-so-similar to Bad Fear, which you have to ignore anytime you leap outside your comfort zone. So similar that it’s nearly impossible to tell them apart. 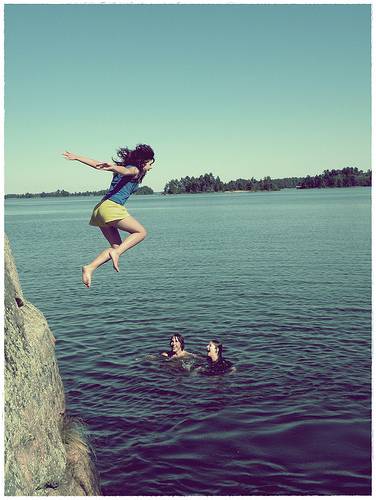 Sometimes a friend's waiting for you in the water, but sometimes you're making the leap on your own. In the weeks leading up to my decision to quit my job, I had a horrible feeling in my stomach. I was scared about making the right choice, scared about telling my boss, scared about leaving behind a reliable paycheck. It probably didn’t help that I was sad about things going on at home, but I can’t remember the last time I felt that much anxiety. Much of that anxiety stemmed from planning to leave a good job. Because I was crazy to leave a good job in this economy, right? After covering the jobs report every month, I’m certainly aware the job market is crummy. I had to remind myself every day that when you’re preparing to take a big risk, anxiety is normal. And yet I still had days when I worried that I might actually be ignoring Good Fear. Was I feeling that way because I was about to make the wrong decision? So here’s what I did: I pushed aside all the fear, both the good and the bad, and listened to my gut. Somehow, while the rest of my body couldn’t tell left from right, my gut knew which choice to make. Of course, even once your gut tells you what to do, you still have to do it. But letting your gut have a say, being in tune with the power of that message, is the first step toward making the right choice. Sometimes, listening to your gut is the only way to differentiate between fear that’s keeping you alive and fear that’s preventing you from really living. When was the last time you had to differentiate between Good Fear and Bad Fear? Went through a similar thing recently (leaving a good job to work for myself). Terrified doesn’t even begin to cover how I felt, and I’d be lying if I said I have it all figured out now. But! Here’s how I knew it was good fear: when I thought about leaving, I felt excited, even if I couldn’t see very far ahead. When I thought about staying, I felt disappointed in myself. Love this way of distinguishing! Thanks for chiming in, Miranda. That’s a great way to describe it! I think if you feel excited about a choice you’re making, that tells you it’s right even if there are still obstacles and things to figure out. Best of luck to both of you in your endeavors! Ha — that’s a great one! Lexi, this is so true. In the weeks leading up to my move to Kenya, I felt a lot of anxiety. One night I took my pants off, laid on my couch, and sobbed. But at the end of my pantless sobbing, I didn’t feel like I had made a mistake. I’m a big believer in the gut. Whenever I’ve contradicted the gut, I’ve regretted it. But it can be a challenge to get past nervousness about life change. I’m so impressed with the decision you made! I often have a hard time figuring out the difference between real and irrational fears (in fact, this is the basis for my blog!). But in a way, every fear is irrational. When crisis hits, you click into survival and fear is completely superfluous. Every time I’ve found myself living out a worst-case scenario, the reality of it isn’t nearly as horrifying as Fear wanted me to believe. The only strength you gain from anxiety is mental preparation, but I believe that can be accomplished without the fear. So in other words, I think all fear is bad fear. Every time I moved across the country to some new place, in pursuit of my next career adventure, I was scared and sad and nervous and excited. This is great! I was just writing on this same subject earlier this week and am so glad you re-sent this in your newsletter today. I often work with my clients on this subject as well (I’m a therapist) especially those who also suffer from anxiety disorders and am looking forward to sharing this resource! While I agree with everything you’ve said, I’m at the point where even knowing what my gut wants has become difficult. I’ve been weighing pros and come for so long that I really don’t know what’s right anymore. I used to think I knew exactly what I wanted but now I’m not so sure. Being pulled in a million different directions makes you forget your gut. How do you think one deals with this? Copyright ©2019 Alexis Grant. All rights reserved.